The South Florida Petanque Club began in 1993 with a core group of 10 members. It has grown over the years to a membership in 2016 of 80 FPUSA members and an additional 75 club members holding federation licenses elsewhere. We are a diverse group with members ranging from 12 to 90+ years of age, and speaking a variety of languages. During the winter, our ranks swell as we welcome the arrival of our snowbird friends (from Europe, Canada, and other states). The Club hosts FPUSA (Federation of Petanque USA) regional and national tournaments as well as numerous club tournaments of varying formats. There are 20 courts available for play. We also host a number of social events throughout the year including our Xmas party, spring lunch, picnics and late afternoon snacks and drinks on different holidays. We welcome players of all skill levels. If you’ve never played before, come try it out. We can loan you balls and provide instruction. The SFPC plays on the petanque courts at John Prince Park, 4759 S. Congress Ave. in Lake Worth, Florida. 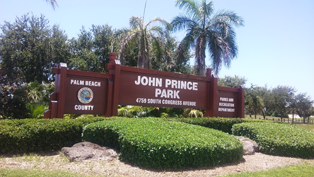 You can enter the park from Congress Ave. south of 6th Ave and follow Prince Dr. to the courts. The Club plays on Sundays at 9 am and Mondays and Thursdays at 1 pm. Please arrive early to register for these tournaments. If you would like to receive an updated schedule and notices of special events, send an email to jmanalan@bellsouth.net to join our email group.